New Zealand is a country of stunning scenery, untouched landscapes and some of the world’s best adventure tours and attractions. If you’re flying into Auckland Airport when arriving in New Zealand, our Auckland motor inn is the ideal Auckland motel accommodation – located just a short drive from the airport. For more information or to book any of the New Zealand tours or attractions below, don’t hesitate to ask at the Auckland Newmarket Motel reception on arrival! Greenworld Tours is an Auckland-based tour company which specialises in tours from Auckland to Rotorua - Taupo - Waitomo and the Bay of Islands. Greenworld Tours’ designer tour division will customise a tour for you for any size group and any destination in New Zealand. Greenworld Tours aim to give you a wide variety of choice, to supply or design a tour suit your needs and your budget. The NZ tour company have packages available for everyone from backpackers to 5 star travellers. The Skyline Skyrides in Rotorua offer gondola rides 900m above Rotorua city and exciting luge tracks which race back down the mountain. At the top of the gondola you can also experience the thrill of the 150ft high Sky Swing at over 120kph. A food court, New Zealand gift shop and helicopter flights are also on offer. Rotorua is located in the North Island of New Zealand, around a three hour drive south from our Epsom motel accommodation. Join thousands of jumpers from around the world that have taken the plunge with Taupo Bungy. 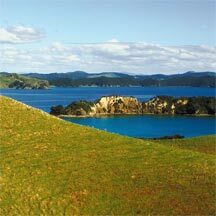 Taupo is located around 3.5 hours’ drive from our corporate Auckland accommodation. Located in the Waikato River valley, upstream of Huka Falls, this unique Cantilever bungy platform sits 47 metres above the Waikato River and is designed to hold you and 99 others. The colour of the water alone is enough to inspire you to jump. Taupo Bungy’s expertly-trained crew pride themselves in providing you with an exhilarating bungy experience. Jump solo or tandem - the choice is yours. Flying by helicopter is one of life's most thrilling sensations and when you experience it in scenery as spectacular as that in the South Island of New Zealand, it becomes very special indeed. Glacier Southern Lakes Helicopters operates a network of scenic flights in and around some of the most magnificent mountain peaks, crystal clear lakes and unusual glaciers you'll find anywhere in the world. The speed and superior visibility only offered by heli-touring delivers a close up and very personal alpine experience; so close it seems as if you could reach out and touch the clouds and the frozen heights. 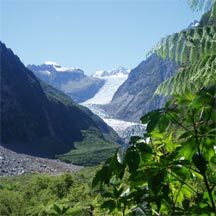 Fox Glacier and Frans Joseph glacier are both located on the west coast of the South Island. To reach the glaciers from our Newmarket motel, fly direct from Auckland International Airport to Christchurch International Airport and take a car, bus or small plane across the South Island to the west coast. Enjoy the delights of punting on tranquil water – it’s the most pleasant way to see the sights of central Christchurch. Allow yourself to be transported back to an elegant era, when the pace of life was more peaceful, and float downstream in and out of the shadows of willow trees that line the Avon River’s banks. Each punt is custom built, beautifully upholstered and operated by trained boatmen. Special outings and points of departure can be arranged. 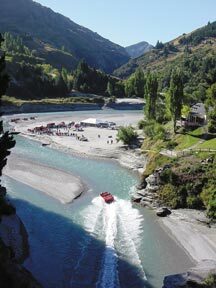 Nothing you have experienced will have prepared you for the excitement of a Shotover Jet ride, speeding past rocky outcrops with only inches to spare, twisting through narrow canyons, and a major highlight - the famous 'Shotover Jet' turn, where your boat spins through a full 360º in its own length. This is all part of the Shotover Jet drive-style that has thrilled over a million and a half visitors since 1970 - and now it's your turn! Queenstown is located at the southern end of the South Island of New Zealand.